Making a King crab sandwich is neither cooking nor preparation, rather an assembling job, but the end result is both easy, esthetically pleasing, and wickedly good. What can beat King Crab and a bottle of prime bubbly. Nothing! I will not deny that peeling and extracting meat from king crab claws involves a fair amount of suffering. Those beasts have taken great care protecting that delicious meat behind an armour of spikes. The good thing is that the shells are soft, and instead of a nutcracker, you just need a pair of scissors to cut the shells open. I bought 1,5 kilo (a little over 3 lb's) of frozen claws, as this treat was offered at the ridiculously low price of NOK 99 (12,50 EUR) per kilo at my local supermarket. I divided the lot into four equally sized portions before freezing them down. I took out two packages of four claws each, a decent portion for a good lunch. We sat down by the table in my country garden and started the work. 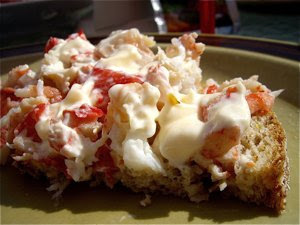 We had toasted two slices of good bread each and then we chopped, cut, tore, and squeezed out every ounce of delicious crab meat until our knuckles were bleeding. Then we placed the heap of meat on toast, squeezed over fresh lime and a large dollop of Hellmann's Mayo!! Susanne had brought a bottle of Moët & Chandon Champagne that had been properly chilled in the fridge, and presto we had one of these culinary million-dollar-moments.